Our interior fit out and design team have an extensive amount of experience in the retail sector having worked on a variety of different retail outlets nationwide. We understand the need to minimise disruption to trade and we take great care in the safety of the public when working in busy environments. Our experiences range from large department stores to small convenience stores. Xtras – Fit out of new store. Bespoke display units, window displays, slat wall panelling, bespoke counters, dry lining read more…..
Debenhams – Worked in phases to complete fit out of Café and toilet area including new family / baby room in a live environment. Bespoke counters, screens, raised mezzanine floor, banquette seating, and tiling. 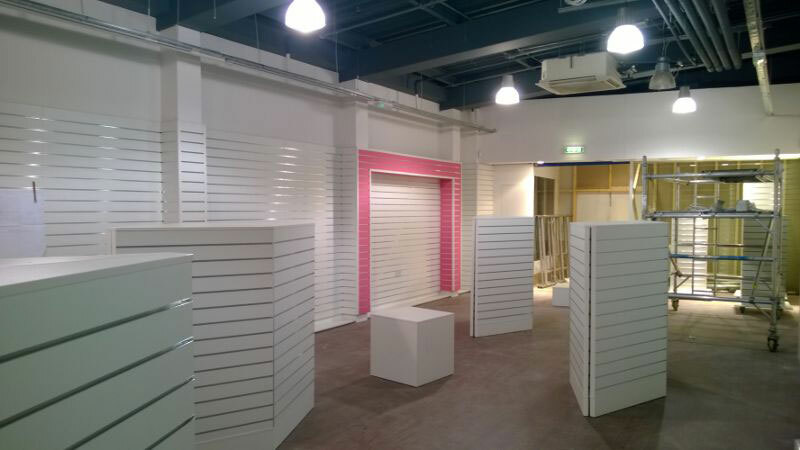 Grainger games – Fit out of new retail outlets. Traditional retail fit out of slat wall and gondola shelving, bespoke counter and bulkheads read more…..
Markham Vale – Office fit out for Gould Alloys. Doorsets, oak skirting and architraves and glazed screens read more…..
Watermead – Office fit out for Dunelm. Door sets, oak skirting and architraves and glazed screens read more…..